No single job description covers all the 274,000-plus pharmacist positions in the United States. 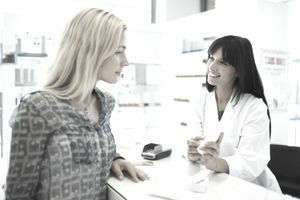 Practice settings for pharmacists vary widely from independently owned drugstores to nationwide grocery store chains, medical centers, military bases and marijuana dispensaries. Despite the professional diversity, researchers with the U.S. Bureau of Labor Statics and officials for pharmacy organizations agree that pharmacists perform a mix of the following tasks while on the job. Items appear roughly in the order of how much time pharmacists spend doing them. Does your practice look different? This is the "filling, licking and sticking" most people imagine when they conjure a mental image of a pharmacist counting out tablets, preparing a bottle label and handling medications to patients. Any time a prescription order is unclear or potentially harmful for a patient, you need to confirm the dosage and formulation (e.g., liquid or tablet), as well as whether brand name product is required or if you can substitute a generic equivalent. Check each patients’ medication record every time he or she gets a new or refill prescription filled. This is the best way for a pharmacist to prevent potentially dangerous interactions between drugs. This involves more than informing about adverse reactions and interactions with other medications, food, alcohol and other beverages like grapefruit juice. Counseling includes training patients how and when to take doses, following up with patients to see if medications are working, sharing tips on how to minimize side effects while maximizing benefits and listening to all of a patient's concerns. Maintaining health requires more than taking prescription medications, Pharmacists can help patients heal and avoid getting sick by sharing advice on using nonprescription remedies, taking health supplements such as vitamins, using herbal and natural health products, exercising and maintaining a good diet. Pharmacists working in a chain and independent pharmacies, especially, have to submit insurance claims and work with private insurance companies, Medicare and Medicaid to ensure payment, and resolve coverage denials so patients do not go with medications. Pharmacists have the ultimate responsibility for ensuring the “three Rs” of right drug, right patient and right dose. Meeting this responsibility requires overseeing the work of and mentoring pharmacy technicians, student interns and residents. Pharmacy owners and supervisors also have responsibilities for making hiring decisions and setting and enforcing workplace policies. Everyone in a pharmacy has some responsibilities for keeping patient files up to date, making sure needed products are stocked and required reports get generated and filed. If you hold a supervisor or management position, you can spend as much or more time on administrative duties as on patient care. Doctors, nurses and other healthcare providers about new medications and drug therapy protocols. Pharmacists also have to complete continuing education courses to maintain and renew their licenses; keep up to date on drug approvals, product recalls and changes to medications’ indications and warnings; and make sure they comply with federal and state laws regulating pharmacy. The last item is especially important. Each state and U.S. territory has its own pharmacy practice law, which changes from year to year. Joining ​your state's pharmacy association can make learning about an complying with practice regulations easier. Earn a pharmacy compounding accreditation.